Cincinnati, OH – For the first time ever, the USEF crowned two horses with its highest honor, one from an International Discipline and one from a National Discipline. Neville Bardos and Sjoerd were named 2011 Horses of the Year at tonight’s USEF annual Horse of the Year celebration. Honored for their accomplishments in 2011 their roads through the last 12 months, while both exceptional, have been very different. Videos of all of the Horses of Honor are available here: http://www.usefnetwork.com/featured/USEFAnnualMeeting2012. He shouldn’t have lived. But he did. He shouldn’t have returned to his life as an event horse. But he returned better than ever. Trapped in a burning barn for 45 minutes, Neville Bardos made a miraculous recovery from injuries sustained in a fire that claimed the lives of six other horses at his rider Boyd Martin’s barn in West Grove, PA. The now 13-year-old Australian Thoroughbred gelding won the USEF National CCI3* championship in 2009 and was 10th at the 2010 Alltech FEI World Equestrian Games – leading the U.S. effort. But his life changed dramatically in the early hours of Memorial Day in 2011. Martin pulled him out of the burning barn to safety. Neville Bardos was left with horrific injuries due to massive amounts of smoke inhalation and the subsequent damage to his throat. Lexington, KY – Voting is now open for the coveted 2011 USEF Equestrian of the Year, which, following decades of tradition, comes at the end of the 2011 competition year and is announced when the horse world meets at the United States Equestrian Federation’s annual Pegasus Awards celebration in January. Known as the USEF Equestrians of Honor, eight stars of equestrian sport – across breed and discipline – each recently received a unique competitive trophy. These honors will be presented during the celebrated Pegasus Awards on January 14 at the Hilton Cincinnati Netherland Plaza in Cincinnati, OH. 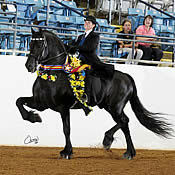 Lexington, KY – Accomplished trainers from the Saddlebred, Morgan and Arabian breeds have been selected as coaches for the 2012 U.S. Saddle Seat World Cup Team. The event will take place in Parys, South Africa, in December of 2012. The 2012 USA Saddle Seat Team Coaches are Cindy Mugnier, Sandra Currier, Kristen Cater, and Brent Jacobs. Cindy Mugnier owns and operates a training stable at Fox Meadow Farm in Massachusetts; she also is a USEF judge and current committee member of USEF Morgan, Saddle Seat Equitation and Saddle Seat Equitation World Cup Committees. Mugnier has served on previous World Cup selection committees and has trained many state, regional, national, and world championship riders. 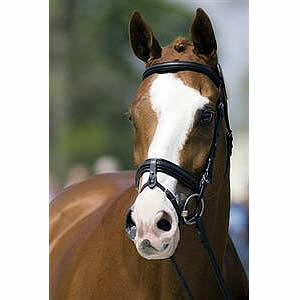 Mugnier is the recipient of the 2007 AMHA Cecil Brown Sportsmanship Award, Massachusetts Morgan Horse Association Woman of the Year, UPHA Chapter 14 Horseperson of the Year, and UPHA Chapter 14 Hall of Fame. Louisville, Kentucky – It’s an annual tradition in Louisville. Champions are crowned, history is made, dreams come true, and sterling silver trophies glisten under the lights of Freedom Hall. 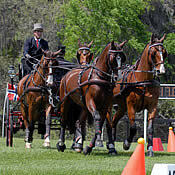 American Saddlebred Horses, Roadster Horses and Hackney and Harness Ponies compete to be called a World’s Champion, a World’s Champion of Champion, or the most desired title: a World’s Grand Champion. 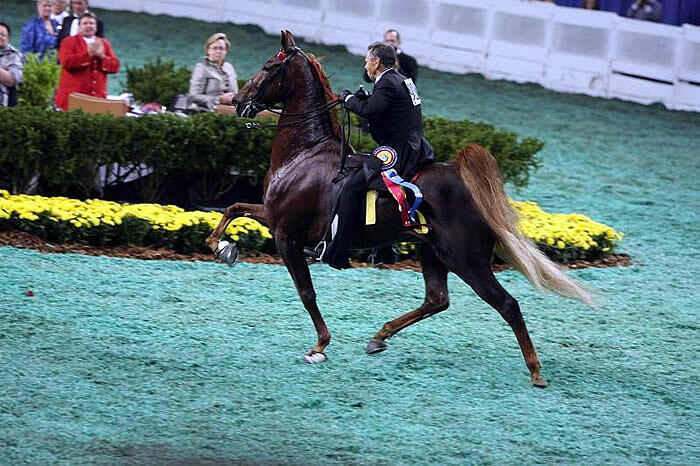 On Saturday, it was a three-peat triumph for rider/trainer Merrill Murray, who celebrated his third – and final – $100,000 Five-Gaited World’s Grand Championship victory atop the American Saddlebred gelding Courageous Lord. The crowd cheered, clapped and whistled on Stake Night – the final night of the weeklong event – for Courageous Lord, clearly the fan favorite. After a crowd rousing victory pass, Murray thanked God, and his wife, blacksmiths, chiropractor, vet, farm owners, and fans of Courageous Lord. And mentioned the ride was no longer his. The 10-year-old chestnut, trained by Murray, was sold to Peter and Lynn Via of Fox Grape Farms about a month ago. Murray announced after his grand performance, which included a work off, the ride now belongs to Dr. Owen Weaver. In other stakes, Real Action, ridden by Peter Cowart, won the Three-Gaited Grand Championship, and Gabe Deknatel and The Daily Lottery repeated as champions in the Amateur Five-Gaited Championship.